MAKE YOUR NEXT PARTY SIZZLE! Are you looking for something besides the same old song and dance? Karaoke is a great way to get that party going. Why not let your friends be the singing stars they've always wanted to be? Our Professional Karaoke Host is a master at making you sound good. With our state-of-the-art system, you don't even need to know the words. The words are displayed on the video screen as the music plays in the background. You will be blown away at how good everyone sounds! Karaoke is great entertainment by itself, or it can be combined with other types of entertainment to make your event complete. 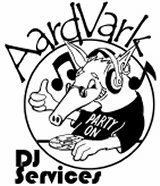 "Larry with Aardvark DJ is wonderful to work with! He is always fully focused on his clients needs and does what ever he can to make sure their special day is perfect. It is so easy and fun to work with Larry - I highly recommend him to anyone looking for a DJ who will listen to their wishes."